The number of Hispanics employed by General Motors is on the rise. They are participating in almost all aspects of the business including manufacturing, engineering, logistics, IT, marketing and sales. Most of them are active members of GM’s Hispanic Initiative Team (GMHIT), the company’s award-winning Employee Resource Group which focuses on promoting the value of diversity, supporting Hispanics within the company, and connecting GM with the Hispanic community. Their stories can motivate young students and others who are interested in working in this field. 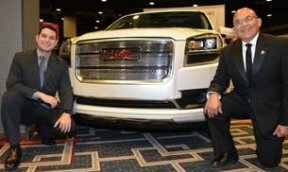 Raul Villarreal and Tony Argote are just two of the Hispanic employees that are making a difference at GM. They each have different roles within the company and their perspectives reflect the variety of experiences that Hispanics will find when pursuing a career in the automotive industry. Raul Villarreal is a native Texan who has a wealth of knowledge and experience in manufacturing with General Motors. Villarreal has held different positions at GM in the United States, Canada, and Spain, and is currently the Paint Area Manager at the Arlington Assembly Plant, where GM employees apply themselves on all the science, technology, engineer and math (STEM) fields of work. His responsibilities include supporting the production of the 2015 Cadillac Escalade, Cadillac Escalade ESV, Chevrolet Suburban, Chevrolet Tahoe, GMC Yukon, and GMC Yukon XL, among others. Tony Argote is another example of a Hispanic story of success at GM. Son of Cuban immigrants, and the first in his family to obtain a college degree, Argote started his career at GM in 2005, when he arrived as a student participating in the cooperative education program through the Georgia Institute of Technology after his first assignment working on the corporate fuel economy model, he worked on various elements of vehicle electrification from hardware design and release to system integration and controls. Argote is part of the Full-Size Truck / SUV Program team and gets to work on the GMC Yukon and Sierra, while helping to lead STEM initiatives at GM and beyond. As proud Latinos, Villarreal and Argote are helping recruit Latinos, acting as mentors and supporting them within the company and in the community. While Tony has served in community organizations from after school programs to founding college organizations for the last ten years, Villarreal is dedicated to help students obtain college scholarships while mentoring and coaching them towards STEM fields of work. © 6502 Chicago Hispanic Newspaper, Lawndale News, Hispanic Bilingual Newspapers, Su Noticiero Bilingue. All rights reserved. XHTML / CSS Valid.